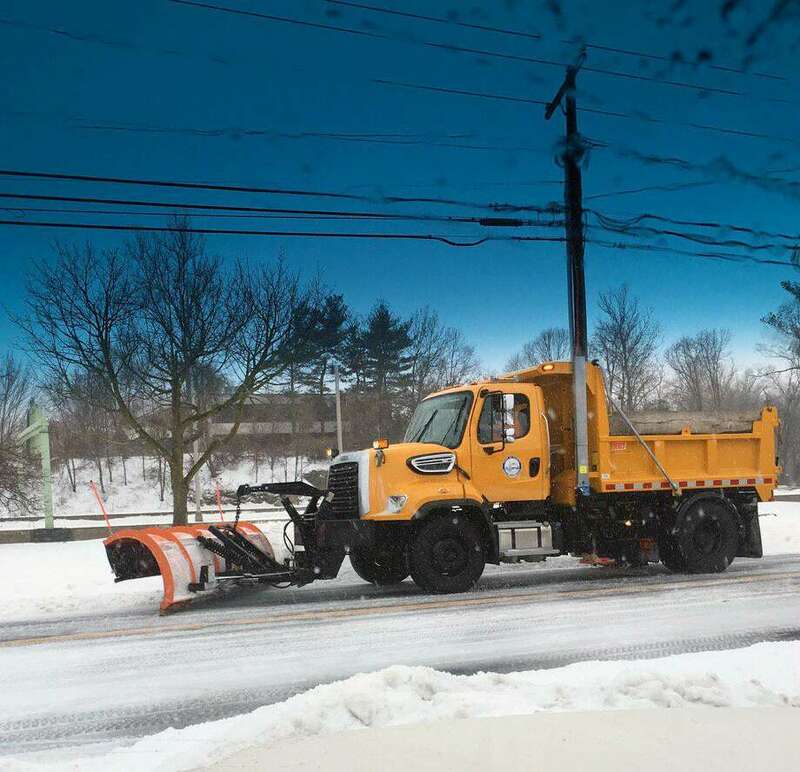 Department of Public Works snow plows clear the roads during Winter Storm Stella on March 14, 2017 in Darien, Conn.
DARIEN — A large-scale project to renovate and improve the town’s Public Works garage took a step forward last week with approvals from the Board of Finance and Selectmen. Both boards voted to authorize the appropriation and bonding of $6.3 million to renovate the 28,000-square-foot garage at 126 Lodge Road, at which structural weaknesses were identified in a 2012 study. “The study told us that the floor was failing and we needed to replace it,” said Town Administrator Kate Buch at a May 25 joint meeting of the two town boards. The garage was built in 1956 and has been renovated twice — in 1971 and 1977 — and according to Director of Public Works Edward Gentile. “The seal that was placed in there was not sufficient to handle to loads of the trucks,” Gentile said. If left unattended, salt and water brought in on town trucks could enter small cracks that have formed, causing the concrete to start eroding. In addition to the floor replacement, the roof of the garage will be replaced and secondary drains will be installed. Two underground 2,000-gallon gasoline and diesel tanks will be replaced by above ground tanks, and wastewater from vehicle washing will be treated by an oil and water separator before being sent to a sanitary sewer, in order to correct noncompliance with Connecticut Department of Energy and Environmental Protection regulations. “We could be fined by the DEEP if we don’t come into compliance,” Buch said. In order to become compliant with the Americans With Disabilities Act, the renovation will focus on entrance and hallway accessibility, updated bathrooms, removal of three interior steps on the first floor and the installation of a ramp and rails system. Sleeping quarters for DPW employees will also be added. According to Buch, in high-intensity storms, employees may be stuck at the facility for shifts of up to 16 hours, with little more than a few old sofas to sleep on. “That’s not appropriate, we don’t want these guys out there on the road in these $200,000 vehicles in dangerous conditions with no rest,” Buch said. In terms of the impact on taxpayers, Buch said that the projected total input from individual residents was projected at $11, or 0.01 mills in Fiscal Year 2018. That number would increase to $57, or 0.05 mills in Fiscal Year 2019 and $67, or 0.06 mills in subsequent years. But, Buch said that the garage will result in savings. For one, expensive town vehicles will be better protected by the new roof and a gas pump canopy, likely increasing their lifespan. First Selectman Jayme Stevenson added that the garage is one of the project's that will hopefully make it possible for Eversource to extend a natural gas line to a group of public buildings in town, including Darien High School and Royle Elementary School. “The town garage is part of a larger portfolio of town facilities that's part of a gas expansion project that’s happening in town. This project is one of the facilities that’s helping us leverage that natural gas expansion,” Stevenson explained. The garage renovation project will go before the Representative Town Meeting (RTM) June 12. Should the RTM approve, work will begin this summer.